Now, I don't consider myself a spiteful person. Usually. Sometimes though, I can be persuaded. Here at camp we have an activity in the morning called Polar Bears. Before anything else in the day, people have the option to jump in to the freezing cold lake. And when I say freezing cold, I mean fed by melted snow from the mountains cold. You can jump in the nice warm pool after. Everyone goes on Monday to check it out. The rest of the week is optional. A few Mondays ago, everyone was milling about during Polar Bears, and I noticed that one counselor had a lot of campers asking for him to jump in the lake. He looked at all of them, turned and looked at me and said "I'll do it if she does it". She being me. Now, I think he was under the impression that I wouldn't do it. He might have been under that impression because I haven't done it in many years. What he didn't know is that I would happily do it, just so he would also have to. 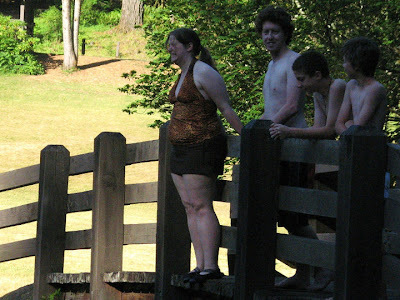 That morning at announcements, I announced to the whole camp what had happened, and that both of us would be jumping in the lake the next morning. Here I am regretting my decision. 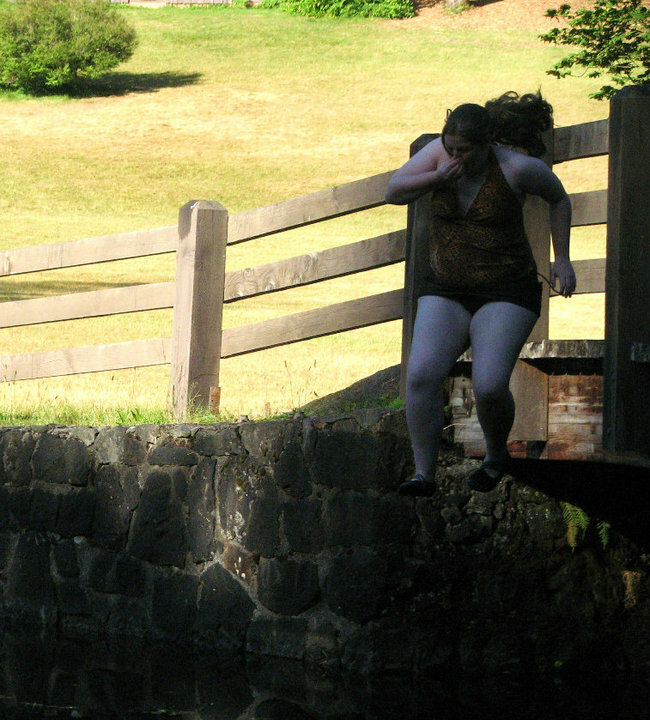 And jumping in the lake. It was very cold, but also refreshing. This past week at camp we had a 48 hour break instead of our regular 24 hours off, so I took advantage of it and went to the Portland Modern Quilt Guild sewing night at Modern Domestic. I really enjoy those sewing nights, and this past one was no exception. One of the other members of the guild, Amber Lee, mentioned that I'd said I'd post something about the arrow blocks in my Hey Cherri quilt. Now, when I made that statement, I'd really meant to do it. I'm just, you know, sort of terrible at regularly updating my blog, or following through on ideas. That sort of thing. 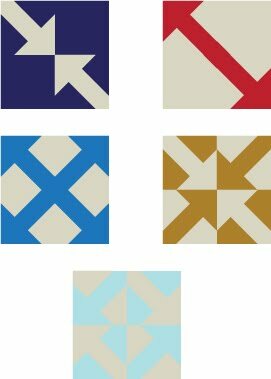 I had some time tonight though, so here is the process for one type of arrow block. The five blocks below are ones that use this technique, which is sort of like a snowball block. I'm sure they could also be made by paper piecing. I made these at a two inch scale, so that's what my measurements reflect. 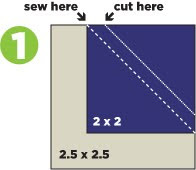 Draw a diagonal line on the 2 x 2 background color block, and sew it to the 2.5 x 2.5 arrow color block as shown. Cut a 1/4 seam allowance and press open. I usually just used scissors and approximated a 1/4 seam allowance. Repeat step 1 on the opposite corner. 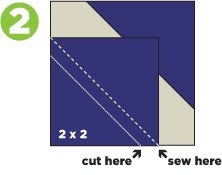 Use the same process as step 1 and 2 to attach the arrow color block. After the final seam is pressed out, you'll have a nice looking arrow block!